This certainly beats a few dry, descriptive paragraphs that will be skimmed over at best. What is it… a single picture tells a thousand words… Here’s the proof. Well done. Thanks, Mark. You’ve certainly contributed to getting my life back on track. And my continued success and endeavors are a result of utilizing Simpleology. However, I’m still having a difficult time understanding ‘Do It Later’. These items go into a list and I won’t see them again until I look at that list. In essence, these items tend to get lost in thought. @GregH12 Hey Greg, thanks for the kind words. As for Do It Later … it’s actually meant to be that way. Most of the stuff we put on a “Do It Later” list we’ll never get to anyway, so why not get it totally off your mind? That way, you don’t have to think about it until you choose to look at it.Now, if you do want to be nagged, you can add a reminder to a Do It Later item very easily … Let me know if you have any trouble finding that. Thank you Mark. I always look forward to new information that will help make us more productive. Looking forward to the next episode! I do a two-column list of things to be done: one column is for things that need to be done daily or weekly (with the day of the week noted) and the second column is ODFD: once done, forever done! Managing Time Perfectly… Thanks Once again Mark….. It is an honor to have you as my mentor. THANKS again. Mark – thanks for this. It’s just another piece of a brillant tool – Simpleolgy – which I use daily as a compass to me cut a clear path through the rough waters of in a world that’s gone (or probably always was) insane. Nice and easy to read these comic strips. Overall, with the ‘new’ interface, it’s getting simpler every day to be free to do more of what matters every day. Thanks, as always, Mark. I’ve even been finding that I do things that have been on the ‘way back burner’ too. That’s kind of miraculous… Best to you and the team! Cool!, Automation to manage time..
Great stuff. This got me interested again Mark. Thanks. Think what to do. Now do what you thought. I understand the idea of Simpleology, and have clicked the ? and gone through the training slides including those for my Elite account, but haven’t yet realized how to integrate it into my daily life and take advantage of its power to streamline. I had asked before, but is there a sandbox or other type of environment with a bunch of “real” data to better show how a Simpleology account should (can) be used? Cheers. 1. Start using the Dream Catcher throughout the day to drop in thoughts, ideas, and to-dos as they come to mind. (The best way to do this is with the Simpelology Browser Add-On for Chrome … and via the SMS to Dream Catcher feature … but any way that is the most convenient for you.)2. Commit to do Start My Day every single work day for the next month. Do it without adding any of the special modules to start. Just master the basic function of it at first. Now, if you want to play around with nonsense data for a while to mess around, you can drop a bunch of example entries into your Dream Catcher and do Start My Day with that data a bunch of times to get comfortable. 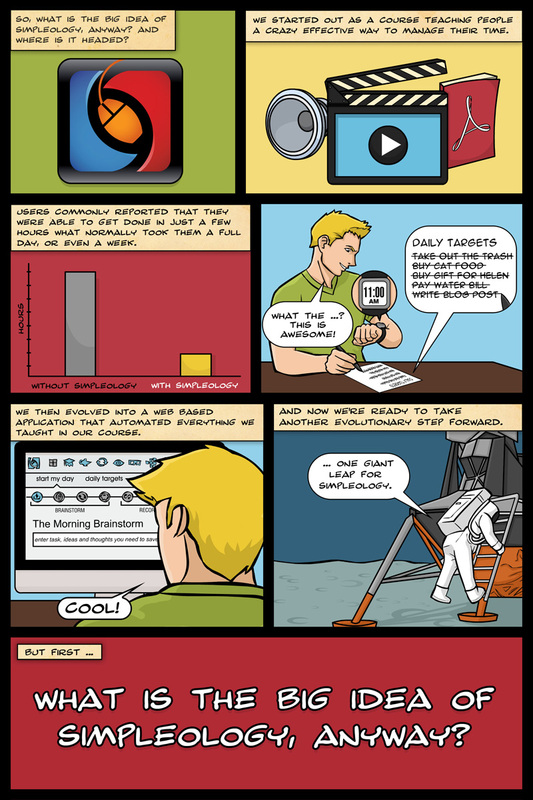 Also, check out the comic book in the last post: The 4 Patterns of Chronic Procrastinators. Failing all this … we have a certification program right around the corner that will walk you through mastering the very basics all the way up to the more sophisticated functions. As soon as that’s out, it will be hard *not* to master the system. Thanks for the reply below to cyburke, that was real useful. One thing I didn’t ‘get’ was when I scheduled something for a future date, after adding to Google calendar it said it would now delete it. Does that mean when the time comes around and Google reminds me, that I add it back in in order to get it on the day’s work list? actually, I am just thinking about this as I write, perhaps the idea is not to schedule stuff like that, put it in the dream catcher and wait until you decide it is relevant? It’s all very new to me so apologies for my confusion. @Quentin Pain Hey Quentin, great questions – these are things we’re working on improving and making clearer. - never let stuff pile up in your Dream Catcher … always process it by doing Start My Day. That keeps your mind, and your plate, clear. That quick 3 point summary has just put me on the right track re Calendar Vrs ‘Do it later’. @Mark Joyner @Quentin Pain Thanks that’s exactly what I needed to know. Yes, I think it’ll be really helpful. well, i like this idea but what if i am somehow confused? Are you telling e that i need guidance on how to manage my me? Do i get you that way? Time well managed o fcourse is money made. To give you a tool to make the most out of your time, energy and money so you can achieve what you really want. It’s a way to change your mindset to one that helps you simply do the stuff you need and want to do. I like the cartoons! This new simpleology is a lot more simple, lol. One thing I would like to suggest. Don’t know if its my ipad or computer, but the interface is a little too light to see. Is anyone experiencing this? Simpleology has started to lift me above the clutter and over load (again!) I’m a long term user, but like everything else, life got in the way and fell by the wayside. Hopefully back on track again, I iove the way that scheduling the tasks using Google calendar results in timely prompts on my iphone to get moving. It also seems that App Cue has joined the party; sending me reminders on a regular basis. One thing on my wish list though – the training viewable on the iPad; Flash and Apple doesn’t mix well. What is the big idea of Simpleology? To me… it’s making life more…simple! I have always liked the direction Simpleology has taken me. As a grade school teacher I wish we could move the training format into the classroom. I bet all my students would stay engaged. Can’t wait to see what else is coming. I just wrote in my journal this morning..
~ to nurture a Natural Flow for myself, to allow enough time so that I don’t feel rushed, stressed or anxious..
~ to be ahead of timeI’m reminded of the phrase, “Notice what shows up”…this was Lightning Fast!!! This is a surefire way to make sure you accomplish all your goals. For anyone that is ADD or has trouble staying on track, this is a godsend.